The exhibition "Guts and Glory: A Parasite Story" runs from April 22 through May 1, 2018, at Morrill Hall. The weird, the exotic, the deadly and even some helpful parasites will be on display at the University of Nebraska State Museum at Morrill Hall beginning April 22. 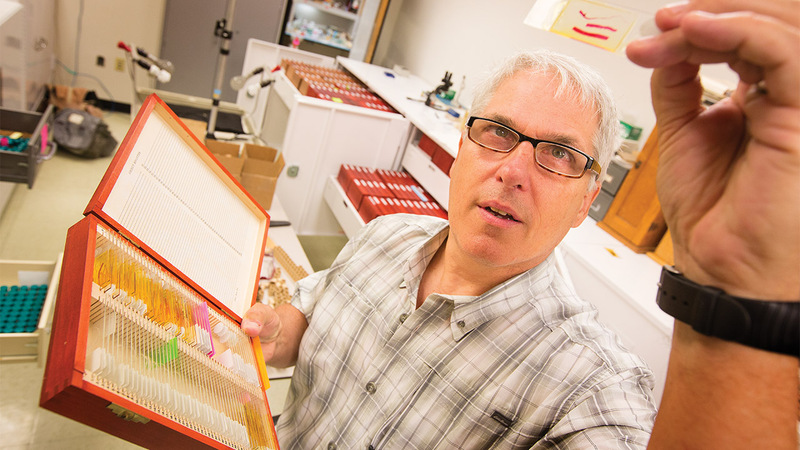 "Guts and Glory: A Parasite Story" is a temporary exhibition exploring the hidden world of parasites while showcasing the museum's Harold W. Manter Laboratory of Parasitology. Visitors will learn why and how research is conducted on the most common lifestyle on Earth – parasitism. Tapeworms, heartworms, fleas, flukes and bot flies will be examined in the exhibition, which runs through May 1, 2018. [VIDEO]: "Guts and Glory: A Parasite Story"
"Guts and Glory" features a life-sized 100-foot whale tapeworm model, the largest parasite on Earth, and a 25-foot wall of real parasite research specimens highlighting the diverse sizes, shapes and lifestyles of parasites in the museum's collection. Visitors can stick their hand into an enlarged model of a coyote intestine to discover the parasites inside and see a "slice of life" through an interactive Sandhills soil cube showing how many parasites co-exist with rodents, reptiles and insects in a diverse yet small section of a Nebraska eco-region. The Manter collection represents 10,000 species with specimens collected from every continent and the world's oceans. 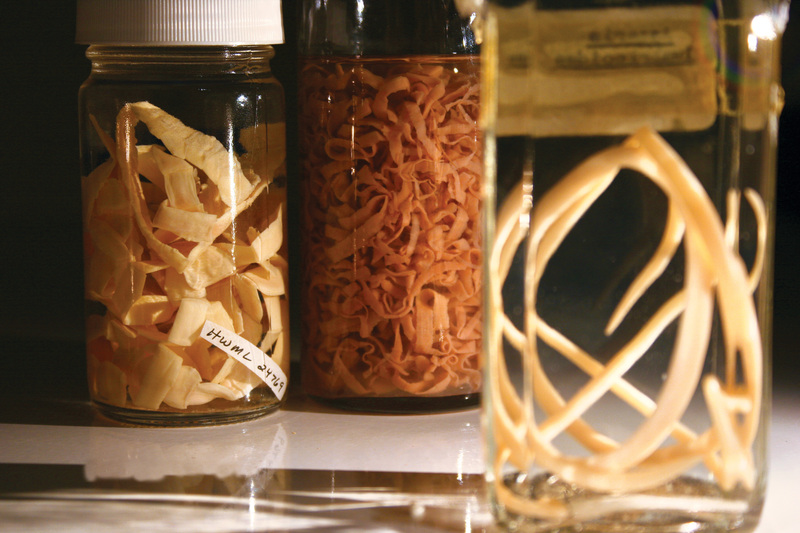 The parasite collection is the second largest in the Western Hemisphere, behind one at the Smithsonian Institution. The lab provides opportunities for the university's scientists, students and visiting scholars to study parasites to understand emerging diseases, evolutionary relationships and the health of ecosystems. "It has been great to see how Nebraska faculty research can be made into a fun, informative exhibit," said Susan Weller, museum director. "Although you likely will leave the exhibit feeling both fascinated and a bit uneasy, you'll be glad someone is finding the parasites before they find us." A public event will mark the opening on April 22. Morrill Hall will be open from 9:30 a.m. to 4:30 p.m. with hands-on activities for visitors from 9:30 a.m. to 1 p.m. The first 150 visitors will receive a free plush toy. Visitors will meet museum scientists and students and learn how they study parasites. Other activities include a game to "travel" the world while trying not to be "infected" with a parasite; information on parasites that infect household pets; and more on which parasites infect different species of animals. Regular museum admission will be charged. 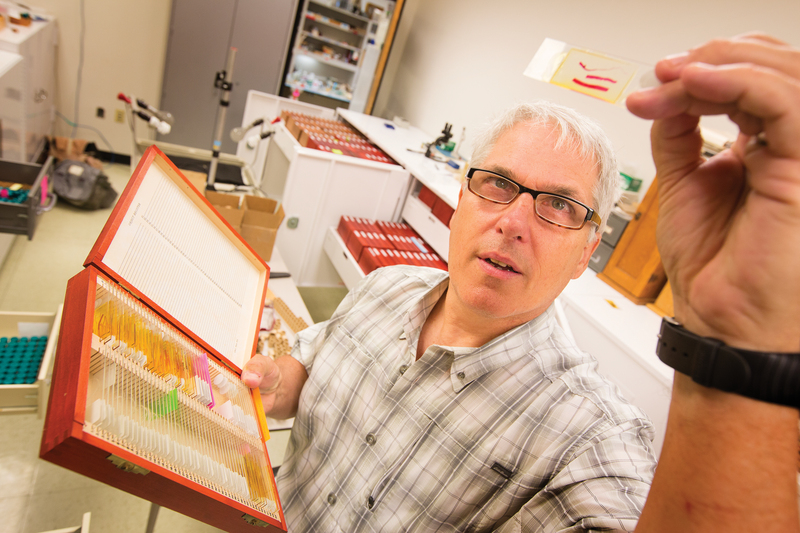 University of Nebraska State Museum curator and parasitologist Scott Gardner holds a specimen slide in the museum's Harold W. Manter Laboratory of Parasitology. Scientific research from the lab and research specimens are featured in the new exhibition "Guts and Glory: A Parasite Story" at Morrill Hall.